The so much anticipated Apple iPhone 7 is now available in stores, right now, getting one is not any easy or convenient challenge because the famous queues in front of Apple stores has been formed again. The latest apple flagship device, the iPhone 7 will be launched first in 28 countries. You might wish to order it online, cos getting one from the store is difficult. 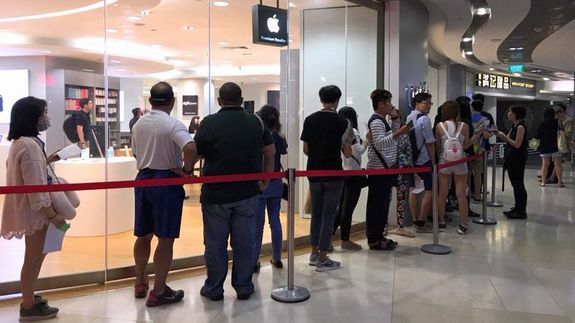 The iPhone 7 Plus has not yet been spotted even though the sales of the iPhone seven, the coveted Jet Black is out of stock. If you plan to buy from the store, be prepared for a long wait. Some persons are fortunate - like Ty Moss, who was the first on the line. And this O2 store tweeted the first happy consumer. For the unfortunate ones, the queue is discouraging and very difficult, having booked a spot doesn't help either.